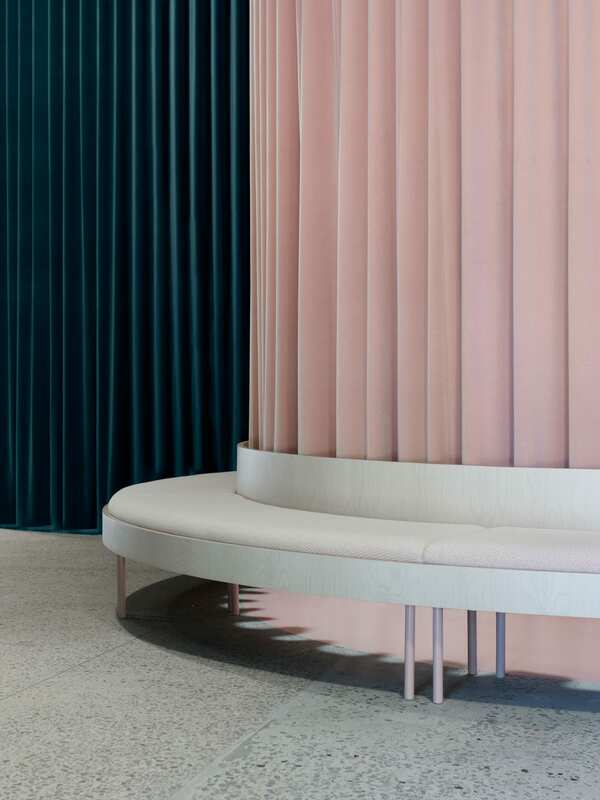 Bresic Whitney’s Rosebery Office Designed by Chenchow Little. You’d be forgiven for thinking you’d just walked into the new digs of the Sydney Dance Company. This interior has all the hallmarks of industrial warehouse meets arts space meets inner-city raw chic. 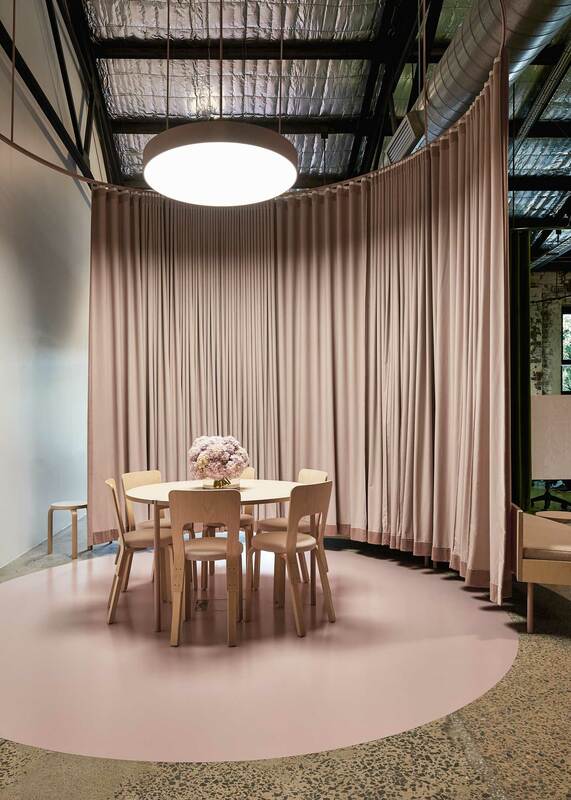 And then, of course, there’s the subtle nod to the pale ballerina pink, noted in the slimline disc lighting, the steel fenestration and the achingly beautiful, double-height draped curtains. But this is no theatre house or performance space. Instead, you’ll be delighted to know, this is a Real Estate Agent’s office. This isn’t the first time Bresic Whitney has teamed up with the powerhouse duo Chenchow Little Architects. It is as though they have found the perfect dance partner in each other. In this game, there’s no point having a vision if your client can’t embrace it. And if your client has a vision they need someone who can translate it. And this is exactly the sort of symbiotic relationship that has developed here. Essentially – they get each other. These guys have been making magic together since they first developed Bresic Whitney’s Darlinghurst offices. Crushing the out-dated idea of what a Real Estate Agent’s space should look like, and in many ways, totally re-designing and re-imagining how offices themselves should be designed. 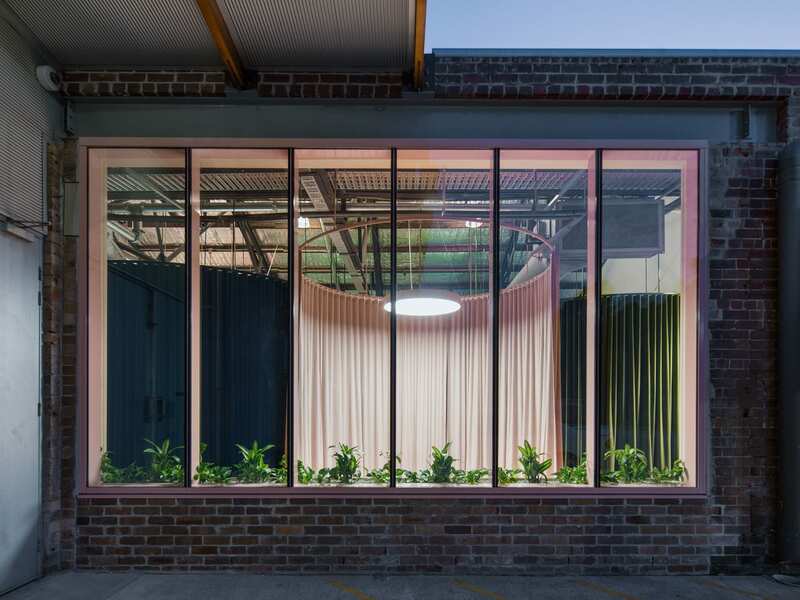 Related: Bresic Whitney Hunters Hill HQ By Chenchow Little. Rosebery it seems is the place to be. 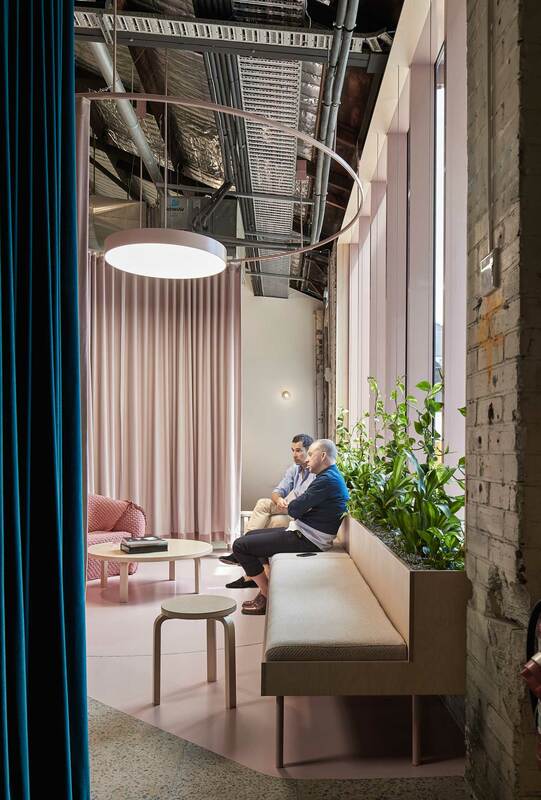 It’s in this revitalised, industrial part of Sydney that Bresic Whitney has taken up its fourth space designed by Chenchow Little. 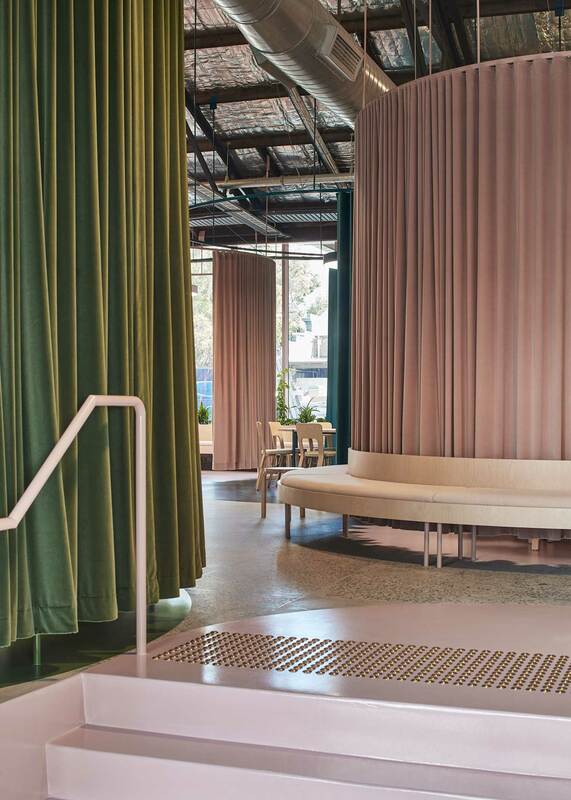 Located in a small warehouse tenancy that forms part of ‘The Cannery’ precinct, Bresic Whitney has shacked up with some pretty impressive neighbours, Koskela, Black Star Pastry, Three Blue Ducks and Archie Rose Distilling Company. 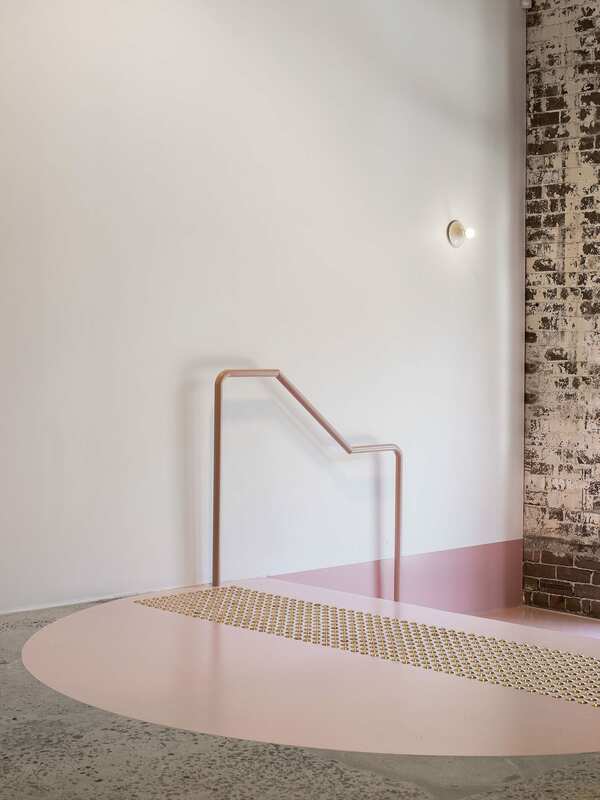 Whilst Chenchow Little have kept all of the essential elements that yell warehouse conversion, unfinished brickwork, exposed ceiling and acres of shiny aluminium insulation, the space still feels carefully articulated. No doubt in part due to the large hoops hanging from the rafters, forming the circular track for those dramatic curtains to glide around. 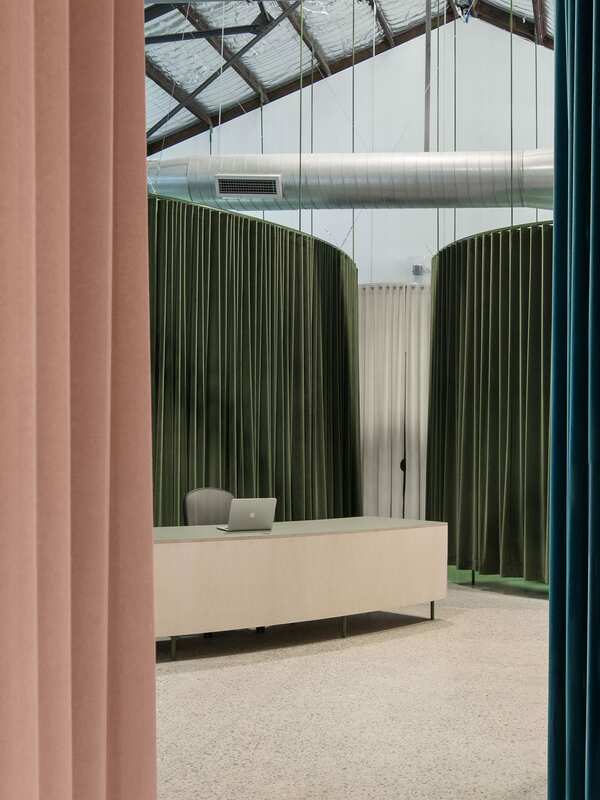 These curtains when pulled closed, sweeping across the white terrazzo floor, form the space for private areas, meeting rooms and such, or they unfold into public spaces, depending on the mood. Circles repeat and repeat in this space. 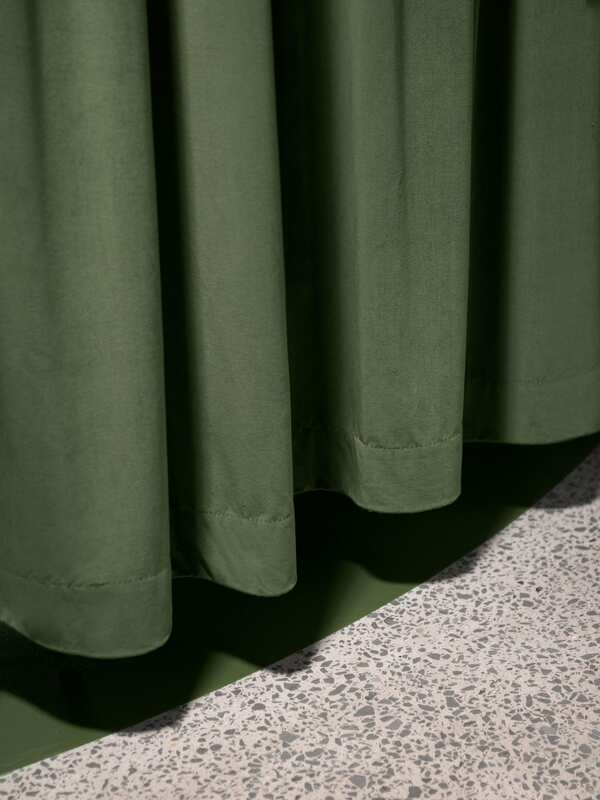 Pink, olive green and indigo circles on the floor, mirror the circles of matching coloured velvet curtains hanging from the exposed roof. The joinery lovingly wraps itself around these curves; Birch plywood benches, like reeds bending in the wind, follow the gentle curves of the geometry. 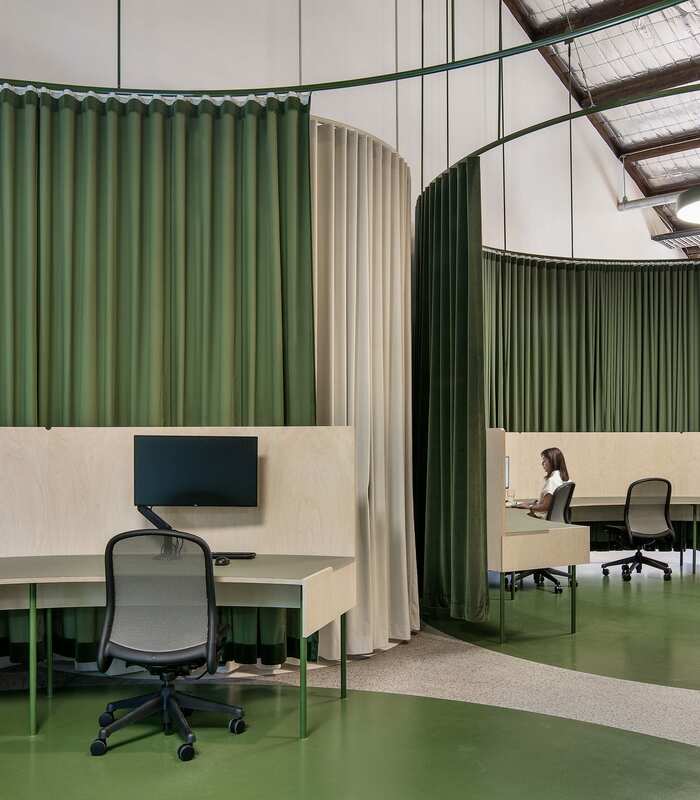 Even the reception and work desks follow suit, all curved to follow the repeating pattern of circles on the floor or the ones hanging from the ceiling overhead. There is something a little bit space age about this interior too. 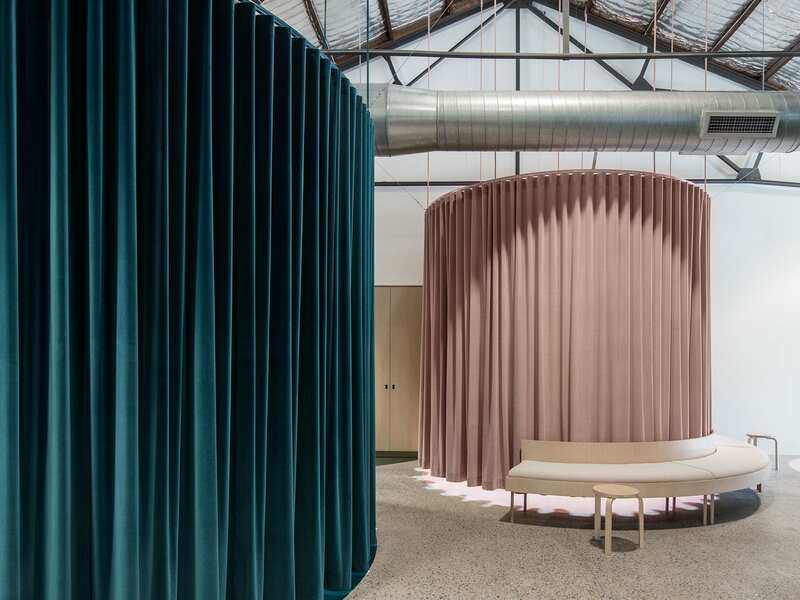 Maybe it’s the restraint in terms of furniture, the cool curved joinery or the dramatic stage-like quality of the fitout. But whatever it is, it is truly striking. It is unlike any Real Estate Office you’re likely to see this side of ‘re-imagined’ anytime soon. 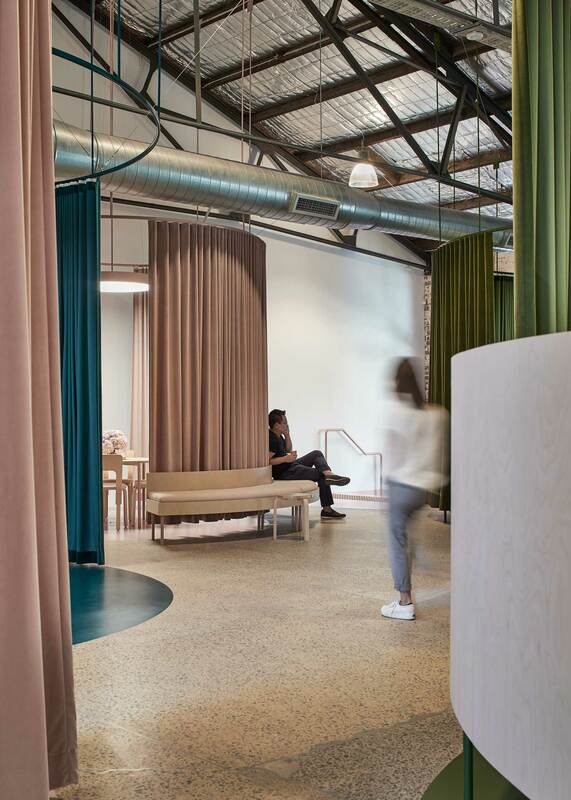 The post Bresic Whitney’s Rosebery Office Designed by Chenchow Little. appeared first on Yellowtrace.